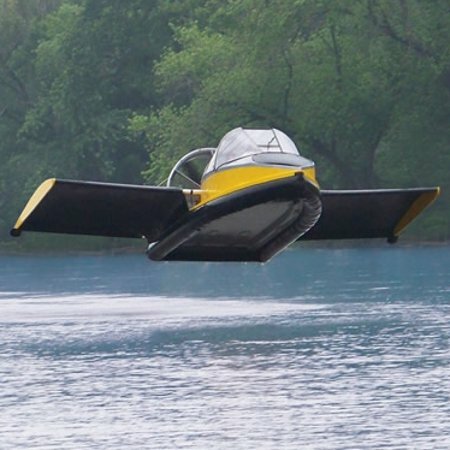 You might not be the king of the world with this $190,000 Flying Hovercraft, but you could pretty much come close when you think about it. After all, it is no pittance, the price tag of this puppy. Basically, the Flying Hovercraft does what it does best – to glide over land and water, and yet being capable of soaring up in the air for up to 70mph thanks to the aid of integrated wings. There is also the presence of a 130-hp twin-cylinder, liquid-cooled gasoline engine which is turbocharged and fuel-injected. The engine will in turn drive its 60″ wood/carbon composite thrust propeller, delivering a 1,100-rpm 34″ lift fan that will inflate its durable vinyl-coated nylon skirt so that it can hover above the ground. It will play nice in fresh- and saltwater conditions, and up to 30% inclines over sand, mud, grass, swamp, desert, ice, and snow. A joystick will let you control three vertical rudders and the elevator, a twist friction-lock throttle controls forward speed, and a variable drive system controls the lift fan for hovering. You can brake, of course, thanks to the lowering of the lift fan’s rpms, and it will eventually end up on Kevlar composite landing skids.